I love using these slips with my students before benchmarks, big tests and other stressful assignments as a reminder that I know they have the potential to do well. Plus a little candy never hurt anybody! Here is a little something to encourage your students before a big test. You can print this on card stock or on a full label sheet. Attach the smartie candies to make this a wonderful sweet treat for your students. 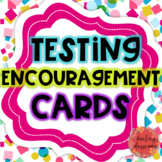 Root on your students as they take their big spring tests with these encouragement cards! Please visit my store to view more plans and resources! Every year our students take state test which can be quite stressful. This word document includes editable notes. I usually print the notes on card-stock paper and attach smartie candies. This is what I am using to encourage my students heading into their end of the year state tests. I will be giving one of these little encouragement notes with a smarties candy attached to each of my students. Hope you enjoy! 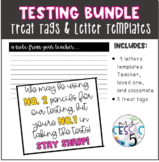 Use these cards for any testing situation to give your kids a boost! I tape SMARTIES onto these, of course!